I have a wonderful story to tell you—a story that, in some respects, out rivals the Arabian Nights fables.... God in his great mercy has permitted me to be, at least somewhat, instrumental in ushering in and introducing to the great wide world an invention that may outrank the electric cars, the automobiles, and all other methods of travel.... I am now going to tell you something of two...boys.... Their names are Orville and Wilbur Wright, of Dayton, Ohio.... These two, perhaps by accident, or may be as a matter of taste, began studying the flights of birds and insects.... They not only studied nature, but they procured the best books, and I think I may say all the papers, the world contains on this subject.... These boys (they are men now), instead of spending their summer vacation with crowds, and with such crowds as are often questionable, as so many do, went away by themselves to a desert place by the seacoast.... With a gliding machine made of sticks and cloth they learned to glide and soar from the top of a hill to the bottom; and by making not only hundreds but more than a thousand experiments, they became so proficient in guiding these gliding machines that they could sail like a bird, and control its movements up and down as well as sidewise.... When they became experts they brought in, as they had planned to do, a gasoline engine to furnish power, and made a little success with their apparatus before winter set.... At first they went only a few hundred feet; and as the opportunity for practice in guiding and controlling it was only a few seconds at a time, their progress was necessarily very slow.... This work, mind you, was all new. Nobody living could give them any advice. It was like exploring a new and unknown domain.... Other experiments had to be made in turning from right to left; and, to make the matter short, it was my privilege, on the 20th day of September, 1904, to see the first successful trip on an air-ship, without a balloon to sustain it, that the world has ever made, that is, to turn the corners and come back to the starting point.... [T]o me the sight of a machine like the one I have pictured, with its white canvas planes and rudders subject to human control, is one of the grandest and most inspiring sights I have ever seen on earth; and when you see one of these graceful crafts sailing over your head, and possibly over your home, as I expect you will in the near future, see if you don’t agree with me that the flying machine is one of God’s most gracious and precious gifts (Root, 1905). The Wright brothers’ methodical research and testing formally established the discipline of aeronautical engineering, but they were not the first aeronautical engineers. In fact, there were many, three of whom were Sir George Cayley, Otto Lilienthal and Samuel P. Langley. The Englishman Cayley, described as the “Father of Aerial Navigation,” like the Wrights, experimented with gliders and tested the lift characteristics of airfoils (wing cross-sections). Cayley’s airfoil testing apparatus, however, moved the airfoil rotationally which, after a few turns of the mechanism, caused the surrounding air to rotate with it, significantly decreasing the lift and reducing the accuracy of the measurements (Anderson, 1989, pp. 6-12). The Wright brothers used wind tunnels for airfoil testing, which is the preferred testing method even today (though modern wind tunnels generally are much larger). Otto Lilienthal could be considered the world’s first hang glider expert, due to the way his gliders were configured and operated. Lilienthal, like Cayley, used a rotational device to measure aerodynamic forces on airfoils. He died in 1896 when the glider he was flying hit a gust of wind that pitched the nose of the vehicle upward causing it to stall, or lose lift, and plummet to the ground (Anderson, pp. 17-19). Hearing of this accident, the Wright brothers decided to put the “elevator” (control surface that regulates vehicle pitch) on the front of their flying machine. The elevator on most modern aircraft is at the rear, just below the vertical tail fin. Samuel Pierpont Langley was contemporary with the Wright brothers, serving at that time as secretary of the Smithsonian Institute. Langley was one of the first to experiment with powered flight, successfully flying two small, unmanned vehicles—outfitted with steam engines—that he called aerodromes. When the Department of War commissioned him to develop a manned air vehicle, he decided to switch to a gasoline engine, which he attached to a larger version of one of his aerodromes. Unfortunately, the two test flights attempted by Langley with his manned aerodrome were miserable failures. The second of these failures occurred on December 8, 1903, just nine days prior to the Wright brothers’ first flight at Kitty Hawk, North Carolina (Anderson, pp. 21-26). I here asked Mr. Langley what first attracted his attention to aerial navigation. “I can’t tell when I was not interested in it,” he replied. “I used to watch the birds flying when I was a boy and to wonder what kept them up.... It finally occurred to me that there must be something in the condition of the air which the soaring birds instinctively understood, but which we do not” (Manly, 1915, Image 62). For some years I have been afflicted with the belief that flight is possible to man.... My general ideas of the subject are similar [to] those held by most practical experimenters, to wit: that what is chiefly needed is skill rather than machinery. The flight of the buzzard and similar sailors is a convincing demonstration of the value of skill, and the partial needlessness of motors. It is possible to fly without motors, but not without knowledge & skill. This I conceive to be fortunate, for man, by reason of his greater intellect, can more reasonably hope to equal birds in knowledge, than to equal nature in the perfection of her machinery (Wright, 1900, Image 1, emp. added). These and numerous other references to bird observations attest to the fact that birds were a dominant source of inspiration for these early aeronautical researchers. In fact, mankind has observed birds and dreamed of flight throughout recorded history, as evidenced by the ancient Greek myth of Daedalus and Icarus. Daedalus is said to have fashioned wings of wax and bird feathers so that he and his son, Icarus, could escape imprisonment on the isle of Crete. The legend says that Icarus, in spite of his father’s warnings, flew too close to the sun, the wax in his wings melted and he perished in the Mediterranean Sea below. While this story is fictional, it certainly reflects the imaginative desire of its author to “take to the air” as a bird. As John D. Anderson, Jr., stated in his foundational text on the aerodynamics of flight: “All early thinking of human flight centered on the imitation of birds” (1989, p. 3). Having no flying experience, it is only natural that man, in his desire to fly, would seek to imitate the readily observable creatures who openly display their capability. And capable they are! Birds are highly specialized both physiologically and instinctively to perform their marvelous feats of flight. Flying birds are uniquely configured for flight in their structure, musculature, profile, metabolism, and instinctive knowledge. Wilbur Wright accurately characterized this in his letter to Chanute when he referred to flying birds as “nature in the perfection of her machinery”—a feature which he said man could not reasonably hope to equal (Wright, 1900, Image 1). It is most interesting to study, as did the pioneers of aviation, the specific qualities of birds that make them wonderfully adept at riding the wind. 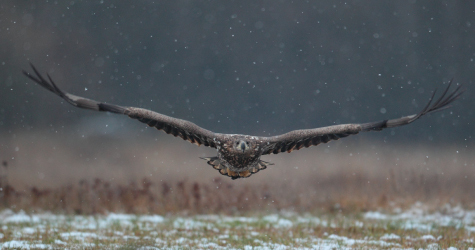 Perhaps the most visible feature of bird flight is the motion (i.e., “flapping”) of the wings. A bird’s wings move in such a way as to produce both lift and thrust simultaneously. Man has never successfully imitated this capability, either in the manipulation of artificial wings in the manner of the Daedalus myth (though many have tried), or mechanically in the tradition of Leonardo DaVinci’s “ornithopter” concepts, prompting Anderson to state that “human-powered flight by flapping wings was always doomed to failure” (1989, p. 4). Indeed, it was the observation that birds sometimes flew without moving their wings, via gliding and soaring, that ultimately led to the success of heavier-than-air flight, through the realization that “fixed wing” flight was also a possible design solution. An eagle’s long, broad wings are effective for soaring. To help reduce turbulence as air passes over the end of the wing, the tips of the end feathers are tapered so that when the eagle fully extends its wings, the tips are widely separated. My observation of the flight of buzzards leads one to believe that they regain their lateral stability when partly overturned by a gust of wind, by a torsion of the tips of the wings (1900, Image 4). That is, birds turn the outer part of their wing to a higher angle relative to the wind to generate more lift on one side, and to a lower angle, reducing the lift, on the other side. This causes the bird to “roll,” in modern aerodynamic vernacular, in order to restore its lateral balance. Wilbur went on to explain his “wing-warping” design for accomplishing lateral stability based on this “observation of the flight of buzzards.” Modern aircraft use “ailerons,” small hinged surfaces on the back side of the wing and near the tip, to provide this lateral balancing, but the aerodynamic principle is the same. [NOTE: The next time you fly, try to sit just behind the wing and note the ailerons moving up and down frequently—keeping the aircraft balanced.] It should be no surprise that the muscles of a bird are specially configured, in size and positioning, to perform the motions of flapping and wingtip torsion. Clearly, the wing of a bird is highly specialized in both structure and musculature to provide the lift, thrust, and lateral equilibrium required for flight. In the early pursuit of human flight, it was a challenge to design a machine that was light enough to fly, but strong enough to survive the flight. All of the Wright brothers’ aerodynamic research to optimize lift would have meant very little had they been unable to design a structure that weighed less than the lift their wings were able to produce. The Wrights used spruce, a strong, lightweight wood, for the frame of their aircraft and covered the frame with muslin cloth. Had they used significant amounts of metal in their structural design, as in modern aircraft, they would not have succeeded. They also had to design and build their own engine since existing designs did not provide satisfactory power-to-weight ratios. Sufficiently strong, lightweight, structural materials, and an engine that maximized power for minimal weight, were critical factors in the Wright brothers’ success. The major bones are hollow and pneumatized [filled substantially with air—JF].... [S]uch bones as the lightweight, hollow humerus are exemplary of this structural complexity (1999, p. 5). Bird beaks also are made of lightweight horn material instead of heavier jaw and teeth structures. Feduccia noted, “[I]t is dogma that the avian body is characterized by light weight” (p. 3), and points out that even the bird skin is “greatly reduced in weight and is paper-thin in most species of flying birds” (p. 10). By far however, the most innovative structural feature contributing to the general flightworthiness of birds is the feather. The phrase “light as a feather” has to be one of the oldest and most-used clichés in the English language. Yet, light as feathers are, their unique structure makes them sufficiently strong to stand against the aerodynamic forces that a bird’s wings routinely experience. 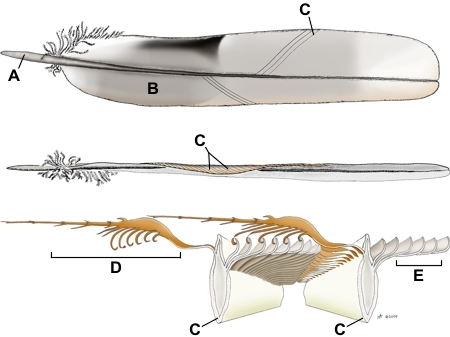 The central shaft or “rachis” (Feduccia, 1999, p. 111) of a feather is an amazing structure, incredibly strong and stiff considering its negligible weight. Feather vanes are composed of fluffy strands, called barbs, that protrude from the shaft. Each barb has small hooks that attach to ridges on adjoining barbs. This characteristic allows feathers to maintain their shape to keep airflow around the bird as streamlined as possible. In fact, Feduccia observes that because of their asymmetry, “flight feathers have an airfoil cross-section” (p. 111), so they must maintain their shape to keep the bird aloft. When these hooks become detached, they have to be carefully aligned to reattach, which is accomplished in remarkable fashion by a bird’s instinctive preening (Vanhorn, 2004). Without a doubt, the feather is one of the most amazing and highly specialized structures in nature. Cross-section of two barbs showing how their barbules “hook” together. KEY: A. Shaft (Rachis); B. Vane; C. Barbs; D. Hooked barbules; E. Ridged barbules. The main muscle arising from the keel and responsible for raising the wing for the recovery stroke in modern birds is the large supracoracoideus, and it has unusual features that allow it to perform this function (p. 10). Feduccia further notes that the bird’s sternum is “keeled,” meaning that it has a forward protrusion to accommodate attachment of the “extensive flight musculature” (p. 10). Indeed, the bird’s muscles and its skeletal structure are uniquely built for flight. Birds are not only structurally specialized for flight, however. The almost constant flapping of wings requires a tremendous amount of energy. Significantly, flying birds possess a metabolic rate that is much higher than most other creatures. This allows them to consume high-energy foods and convert that food efficiently enough to supply the large quantity of energy required for flight. Feduccia comments that “birds are highly tuned metabolic machines” (1999, p. 1). High-energy fuel is not the only requirement for a high metabolism, however. Such high-rate energy conversion also requires significant amounts of oxygen. A bird’s lungs are unlike those found in any other creature. Birds do not have to breathe out, as do other vertebrates. It is not difficult to see how breathing out would be detrimental to flight; this would be much like the thrust reversal mechanisms used on modern aircraft to slow them down after landing, though on a smaller scale. Instead, the lungs of a bird are configured to allow air to flow through and out the other end, after it has acquired oxygen from the air much more efficiently than the lungs of other animals (Feduccia, p. 388). The oxygen obtained is sent to sacs throughout the bird’s body, helping to maintain balance and supply the oxygen as directly as possible to the hard-working flight muscles. The metabolic system of the bird is unique in the animal kingdom, and perfectly suited to a flying creature. The Wright brothers could not have known all of these facts regarding bird metabolism or the specifics of the structural specializations that make birds flightworthy. They were, however, highly impressed with the ability of birds to manipulate their physiology to control their speed and direction of flight, and to perform amazing acrobatic feats in the air. A critical piece of the Wrights’ success in developing the first practical aircraft is the “three-axis” control system that they devised. The wing-warping that controlled the “roll” orientation of their aircraft has already been discussed. The wing-warping, however, also provided steering control of the aircraft, working with the rudder (the Wrights had observed that gliding/soaring birds would generally “roll” into turns). The steering orientation of an aircraft is known as “yaw.” Finally, the elevator control surface provided regulation of the “pitch” (nose up/down) orientation of their aircraft. While it did provide full control of all three of these “axes,” the Wright design was “statically unstable,” meaning that if the pilot let go of the controls, even for a very brief period of time, the machine would crash. In contrast, most modern passenger aircraft are designed to be statically stable. This constant expenditure of control effort was physically exhausting; nonetheless, the Wright brothers became highly skilled pilots as a result of practicing with their machines. This pursuit to control the aerodynamics of their machine is consistent with Wilbur Wright’s stated belief that “man, by reason of his greater intellect, can more reasonably hope to equal birds in knowledge” (Wright, 1900, Image 1, emp. added). Eventually, the “fly-by-wire” concept was developed whereby computers came to perform many of the flight control functions that the Wrights had to actuate manually. Coupled with statically stable aircraft designs, fly-by-wire made flying much less strenuous for the pilot. Human beings, unlike birds, have the ability to analyze and understand concepts like aerodynamic forces and, in turn, manipulate that understanding to their own benefit. Though birds certainly do not come close to man in intellect, they are quite masterful in controlling their bodies and wings to achieve remarkable maneuvers in the air. Human beings in aircraft have never duplicated many of the flight maneuvers that birds perform with apparent ease. This fact is illustrated by recent, and ongoing, research studying how birds use vortices (regions of rotating air) that are created at the front (leading) edge of their wings to create lift (Videler, et al., 2004), as well as how they turn sharply at high speed (Muller and Lentink, 2004). Leading edge vortices are used in supersonic aircraft with small, delta-shaped wings to provide additional lift while landing, but Muller and Lentink suggested that the principle can be further exploited to increase significantly the maneuverability of these aircraft. A V-22 Osprey can rotate its engines to transition from hovering to forward flight and vice versa. How is it, though, that birds know precisely when to flap, twist the tips of their wings, pull their head back to change their center of gravity, fan out their tail feathers, sweep their wings back to manipulate leading edge vortices, glide, soar, preen, etc.? Langley was addressing this very question when he said, “It finally occurred to me that there must be something in the condition of the air which the soaring birds instinctively understood, but which we do not” (Manly, 1915, Image 62). Birds must instinctively know how to control properly their physiology for flight, because they certainly do not have the reasoning ability of humans that would allow them to hypothesize about the nature of air movement and verify their reasoning experimentally, as did the pioneers of human aviation. Yet in spite of this reality, a bird coming to rest lightly on top of a fence post eclipses everything humans have been able to accomplish in 100+ years of concentrated flight design. Even aircraft with vertical takeoff and landing (VTOL) capability like the AV-8 Harrier and the V-22 Osprey cannot pinpoint a landing that accurately. How did birds arrive at this instinctive knowledge? Evolutionary theories of how bird flight might have evolved fall generally into two groups. The first group involves the so-called “ground-up” theories. This is the idea that dinosaurian reptiles evolved the ability to fly, after being lucky enough to sprout rudimentary wings, presumably driven by the desire to catch flying insects for food. Feduccia himself does not subscribe to the ground-up theories, but is instead a proponent of the other group, the so-called “arboreal” theories of bird evolution. These theories suggest that tree-dwelling reptiles (dinosaur ancestors in Feduccia’s view) learned to fly after first learning to glide, most likely in order to escape predators (see Feduccia’s chapter titled “Genesis of Avian Flight,” pp. 93-111). Even the gap between gliding and flying is enormous, however. Sir George Cayley is known to have successfully flown a manned glider as early as 1853, but it would be over 50 years before the first successful powered flight at Kitty Hawk, in spite of the intense efforts of many including, most notably, Samuel Langley. One could, technically, establish a phylogeny [evolutionary ancestry—JF] of birds, or any other group, exclusively of the fossil record, and perhaps have a reasonably good idea of the major lineages using evidence from such diverse areas as anatomy and biochemical and genetic (DNA) comparisons. Yet, even then, problems are legion. Not only is there considerable argument about the methodology that should be employed, but the search for meaningful anatomical features (known as characters) that elucidate relationships is laden with problems because, beneath their feathers, birds tend to look very much alike anatomically (p. 1). Amazingly adept fliers, birds provide mankind with the inspiration and impetus to pursue the ability to fly. In other words, birds look like birds, and the fossil evidence suggests that they always have. This dilemma is particularly troubling for evolutionists when it comes to feathers, where according to Feduccia, “Feathers are unique to birds, and no known structure intermediate between scales and feathers has been identified. Nevertheless, it has generally been accepted that feathers are directly derived from reptilian scales...” (p. 113). Even the feathers of the urvogel (literally, “first bird”), known as Archaeopteryx, are said to have a pattern “essentially that of modern birds” (p. 111). Speaking of the urvogel, Feduccia at one point stated, “The Archaeopteryx fossil is, in fact, the most superb example of a specimen perfectly intermediate between two higher groups of living organisms” (p. 1, emp. added). Ironically, however, he later came very close to contradicting himself when he counters the “ground-up” theories of flight origin by observing that “most recent studies have shown Archaeopteryx to be much more birdlike than previously thought” (p. 103). [NOTE: For a refutation of the evolutionist’s erroneous claims regarding Archaeopteryx as a “missing link,” see Harrub and Thompson, 2001, 21:25-31.] So, how does evolution explain the lack of fossil evidence for the evolution of birds? Feduccia explained, “All these known facts point to a dramatic, explosive post-Cretaceous adaptive radiation” (p. 404). In other words, it happened very fast in evolutionary terms (as little as five million years according to Feduccia)—supposedly too fast to leave behind any transitional fossils. Five million years is a very long time for the total absence of a transitional fossil record (all of human history could unfold more than 830 times in five million years). How convenient for evolutionists to assert that evolution occurred quickly during those periods that lack transitional fossils. Their theory depends on missing links—yet these links are still missing. As if explaining the evolution of bird flight was not difficult enough, though, evolutionists still need to explain the evolution of flight in insects, pterosaurs, and bats as well—also with no transitional fossil evidence. It is unanimously acknowledged that the Wright brothers designed and built the first practical heavier-than-air flying machine. The contributions of Cayley, Lilienthal, Langley, and others leading to that event, are also readily recognized. However, many, like Feduccia, observe birds just as these aviation pioneers once did, but see it as the end result of millions of years of accidental, unlikely random mutations refined by a process of natural selection. Considering the complexity and multiplicity of specializations required to give flying birds their ability, this viewpoint is very difficult to swallow (pardon the pun). The structure of a bird’s feather, alone, is sufficient evidence of irreducible complexity (Vanhorn, 2004), but taking all of the bird’s specializations into account, the irreducible complexity becomes absolutely overwhelming. Even if we suppose that some animal could obtain “nature in the perfection of her machinery” by accident (an accident of miraculous proportions to be sure), how would it survive long enough to learn to use that machinery? Further, assuming it was fortunate enough to develop the physical attributes of flight and managed to learn how to use them, how could it pass that knowledge to future generations of avians without intellectual understanding? It took man, with his far superior intellect, around 6,000 years to make the first halting leaps in flight, and he has not even come close to equaling, much less surpassing, a simple bird’s mastery of the skies. No, the evolutionary explanation is quite inadequate and unscientific. In the Old Testament, God asked Job: “Is it by your understanding that the hawk soars, stretching his wings toward the south?” (Job 39:26). Clearly, God’s question is rhetorical and assumes that Job would have had ample opportunity to observe birds in flight and marvel at their ability. Job may never have dreamed that man would one day share the skies with birds, so he most assuredly acknowledged that the flight of the hawk was well beyond his own understanding. All of our achievements in flight, however, have only served to underscore the meaning behind God’s question to Job. In spite of all we have accomplished in flight design, we still do not fully understand how birds, insects, and bats do what they do. We do understand, however, that they did not design themselves, we certainly did not make birds capable of flight, nor did we teach them how to fly. In fact, we must humbly admit that they taught us. Flight is, in a morphological sense, the biomechanically and physiologically most restrictive vertebrate locomotor adaptation permitting little latitude for new designs.... As an analogy, an engineer can construct a terrestrial vehicle in diverse configurations, but there is really only one basic design for a fixed-wing aircraft (p. 3, emp. added). He meant for this suggestion to explain why there is little divergence, or differences in characteristics, among bird species. But he unwittingly made the point, instead, that this lack of divergence points most naturally to design. Since flight is such a “restrictive adaptation,” random processes, which depend by definition on probabilities, are much more likely to “select away” from the ability, regardless of the benefit it might hold for the animal. Thus, evolution is simply at a loss to explain the abundance, diversity, and very existence of the flying creatures that we observe. Furthermore, optimization, invention, design, and fine-tuning are not processes that occur naturally, randomly, or by accident. They occur only through focused application of intellectual ability. Likewise, the accomplishment of December 17, 1903 was no accident. The Wright brothers could not have designed their flying machine carelessly, much less randomly, and their airplane would not have flown as it did in the absence of their skillful piloting. They did not develop piloting skills naturally or by chance, either, but through arduous, disciplined experimentation and practice. Neither could the specializations and instincts that allow birds to navigate the skies have happened by accident. No, the hawk does not fly by our understanding. Instead, the hawk, sparrow, owl, thrush, swallow, etc., fly by instinct, possessing an inherent “fly by wire” control computer designed by One whose capability far exceeds that of Orville and Wilbur Wright, Samuel Langley, Otto Lilienthal, George Cayley, or any other human being. The Wright flyer required strenuous exertion by the pilot to be able to fly, but God designed His flying machines, not only to have the capability of flight, but also to know inherently how to use it to incredibly impressive effectiveness. It has been said, “If God had wanted man to fly, He would have given him wings.” Actually, He did. God, the Master Designer, both created the wondrous flying creatures that we observe, and gave His crowning design, man, the ability to observe, reason, and imitate. Thus, He provided both the inspiration and the means for man to achieve everything he has accomplished in his brief history of flight. So, with regard to either birds or the airplanes we see passing over our heads and homes, as Amos Ives Root observed so long ago, “the flying machine is one of God’s most gracious and precious gifts” (1905). Anderson, Jr., John D. (1989), Introduction to Flight (New York: McGraw-Hill), third edition. Feduccia, Alan (1999), The Origin and Evolution of Birds (New Haven, CT: Yale University Press), second edition. Harrub, Brad and Bert Thompson (2001), “Archaeopteryx, Archaeoraptor, and the “Dinosaurs-To-Birds” Theory—[Part I],” Reason & Revelation, 21:25-31, April. Hedrick, Tyson L., James R. Usherwood, and Andrew A. Biewener (2004), “Wing Inertia and Whole Body Acceleration: An Analysis of Instantaneous Aero­dynamic Force Production in Cockatiels (Nymphicus hollandicus) Flying across a Range of Speeds,” The Journal of Exper­imental Biology, 207:1689-1702. Manly, Charles M. (1915), “Legal Cases—Wright Co. v. Curtiss Aeroplane Co.—Affidavits: Manly, Charles M.,” The Wilbur and Orville Wright Papers, January 19, Library of Congress, [On-line], URL: http://memory.loc.gov/cgi-bin/ampage?collId=mwright&fileName=04 /04109/mwright04109.db&recNum=61&itemLink=r?ammem/wright:@ field(DOCID+@lit(wright002721)). Muller, U.K., and D. Lentink (2004), “Turning on a Dime,” Science, 306:1899, December 10. Root, Amos Ives (1905), “First Published Account of the Wright Brothers Flight,” Gleanings in Bee Culture (Medina, OH: A.I. Root Company), [On-line], URL: http://www.rootcandles.com/about/wrightbrothers.cfm. Vanhorn, Matthew (2004), “Words of a Feather,” Apologetics Press, [On-line], URL: http://apologeticspress.org/articles/2610. Videler, J. J., et al., (2004), “Leading-Edge Vortex Lifts Swifts,” Science, 306:1960-1962, December 10. Wright, Wilbur (1900), “Octave Chanute Papers: Special Correspondence,” The Wilbur and Orville Wright Papers, May 13, Library of Congress, [On-line], URL: http://memory.loc.gov/cgi-bin/ampage?collId=mwright&fileName=06/ 06001/mwright06001.db&recNum=0&itemLink=r?ammem/wright:@field( DOCID+@lit(wright002804)).